Students in the Upper Elementary program follow a comprehensive and rigorous curriculum structured around a three-year continuum. Each subject is supported by integrated research activities and independent study designed to promote curiosity and self-motivation. 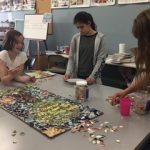 At the culmination of the program students design and present a project that showcases both the skills and content encompassed by the Upper Elementary curriculum.